Failed test of the Bulava missile in 2013. Picture from the Barents Observer. Surprise is a political technique Russia’s President Vladimir Putin excels at, and he did not miss the occasion to spring big surprises during his annual address to the parliament, on 1 March. The first half of the speech contained a rich menu of economic and social promises, but Putin’s delivery was uninspired, as if he was merely going through the motions before arriving at his preferred focus—new and developing Russian missile programs. Nobody had expected him to elaborate at such length on this matter, despite the fact that nuclear and missile stockpiles have been a traditional marker of Russia’s strength, and most of this arsenal is deployed towards the Arctic theater. Putin attacked the theme with passion resembling Nikita Khrushchev’s braggadocio and presented video animations that resembled the first series in the “Star Wars” epic. The audience of about a thousand past-middle-age men and a few women, most of whom had no idea about what he was talking about, awarded the leader with a rousing ovation. The expert community, meanwhile, is puzzled rather than surprised. Most of Putin’s pompous revelations referred to old and not particularly successful projects, like the heavy ballistic missile Sarmat, which had only one ejection test last December. Other projects Putin “revealed” are still under-developed designs, like the truck-mounted laser gun, or figments of nuclear-engineering imagination, like the extra-fast and super-quiet nuclear torpedo or the nuclear-propelled cruise missile. All these fanciful weapons systems were “invented” back in the 1980s, when the Soviet Union was desperately working on asymmetric responses to US President Ronald Reagan’s Strategic Defense Initiative (SDI). Even if some of them are actually deployed in the near future, it will make essentially no difference for mutual deterrence, because nothing resembling a comprehensive or foolproof anti-missile shield is going to appear in the United States anytime soon. 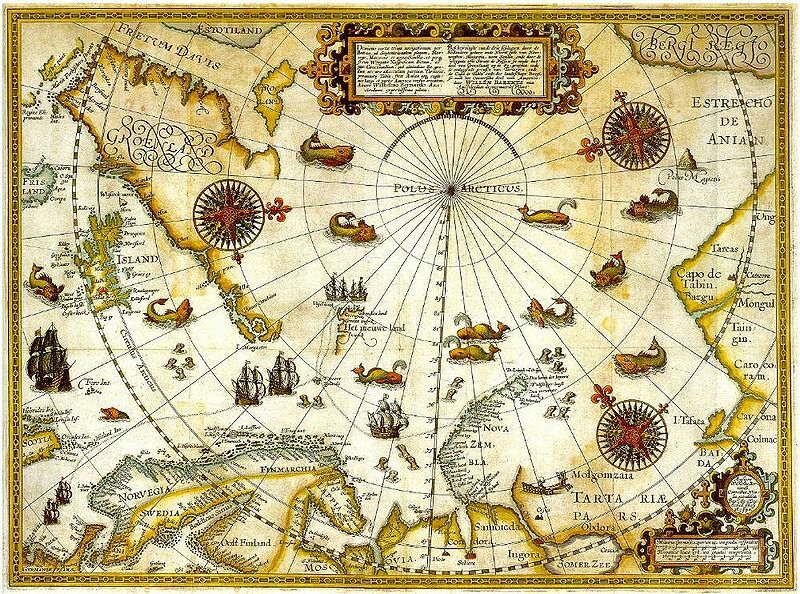 It might, however, damage the prospect for sustaining international cooperation in the Arctic. Such respected US expert as Steven Pifer suspects that Putin has “something of a fixation on things nuclear” and compares this trumpeting of wonder-missiles with President Donald Trump’s slogan “Jobs! Jobs! Jobs!” Putin is, after all, campaigning for re-election (the vote is March 18), though the outcome is pre-determined. In fact, Putin’s animated presentation betrays ignorance rather than interest in missile technologies. He has indeed expounded on nuclear-strategic matters quite a few times, but not recently—and never in such fanciful detail. He was arguing, in particular, for making the Arctic free from “geopolitical games“. Careful assessments of Russian missile programs are necessary, but they cannot explain what prompted Putin to go ballistic—and why now? One part of the answer could be in plain sight: It was only in late February that Putin finally signed the long-postponed 2027 State Armament Program, a procurement plan for which defense industries fiercely lobbied and which the Finance Ministry desperately tried to cut. Several missile design bureaus are among the winners in this budget battle, and Putin now feels the need to justify his decision. This bureaucratic logic clashes absurdly with strategic common sense: He brags about virtual missiles able to break through the non-existent American missile defense. Strategic weapons were the main priority in the not-that-successfully-executed 2020 State Armament Program, but the top brass prefers not to elaborate on its many shortcomings. One of the most troubling is the performance of the Bulava missile for the Borei-class submarines, which has a checkered record of tests by the Northern Fleet, but was launched only once in 2017, and once in 2016. It is increasingly obvious that the huge investment in this new generation of strategic submarines is a luxury that Russia can ill afford. Their patrols make no difference whatsoever in the theaters where real security threats need to be managed—from the Donbass war zone to the border with North Korea. In addition to the three now-operational Borei-class subs, five more keels are laid down, so more money needs to be channeled into this exorbitant program. Putin needs to find a way to harvest any political dividends he can from this investment, and making missiles into the main theme of his annual address is a reasonably safe way to score a few cheap points. Putin is by no means a natural militarist, and he knows that his lieutenants and subordinates are too corrupt for Russia to be able to engage in a real arms race. He surely feels the political need to assert Russian “greatness.” This greatness has lagged and decayed under his ineffectual leadership—and only missiles are left for Putin to rely on. The emotional comment in his speech that “nobody wanted to listen to us…so listen now” contains yet another part of the answer to the “Why now?” question, though it doesn’t mean that Russia is ready to talk. Moscow has shown no inclination to resume meaningful negotiations on strategic arms control, and Deputy Foreign Minister Sergei Ryabkov cancelled scheduled consultations on strategic stability with U.S. Under Secretary of State Thomas Shannon this week. Foreign Minister Sergei Lavrov’s remarks at the recent Conference on Disarmament in Geneva amounted to accusing the United States of preparing for a nuclear war in Europe. And Putin’s address did nothing to dispel persistent U.S. accusations that Russia is in violation of the 1988 Intermediate-Range Nuclear Forces (INF) Treaty. It is not that Putin strives to start negotiations, but rather that he wants to arrest the decline of Russia’s relevance on the international arena. Reinforcing the delusion of “greatness” in his domestic audience is easy, but another important addressee, quite possibly, was China, which is inclined to take the “strategic partnership” with Russia for granted and was mentioned only once in Putin’s speech. Sustained joint efforts by the United States and China in managing the North Korean crisis (which Putin didn’t find opportune to mention at all) upsets Moscow, which cannot contribute meaningfully to this counter-proliferation work but resents the neglect. Russia’s economic weakness is so profound that Russia cannot possibly engage in anything resembling a real arms race with the United States and NATO.It doesn’t take a shrewd strategic mind to conclude that Russia can only proceed with these entirely unnecessary weapon programs at the expense of addressing its more pressing economic needs and acute security challenges, including in High North. Putin’s posturing cannot meet many strict reality checks, but it is nevertheless, dangerous because it damages the norm of owning nuclear weapons responsibly. For more, take a look at “Missiles of March: A political means of last resort for Putin” (Order from Chaos) and “Putin’s answer to Russia’s many problems: Missiles and more missiles” (Eurasia Daily Monitor). Taking ownership of and “conquering” the Arctic are themes Russian authorities love to amplify. But sometimes, the harsh Northern reality interferes. The crash of an Mi-8 helicopter in Svalbard (Spitsbergen), last Thursday (October 26), with eight lives lost, was one such occasion. Norway launched a rescue operation within 30 minutes, while Russian officials continued to falter for hours about the unclear circumstances surrounding the incident; the Russian search party arrived only on Sunday. 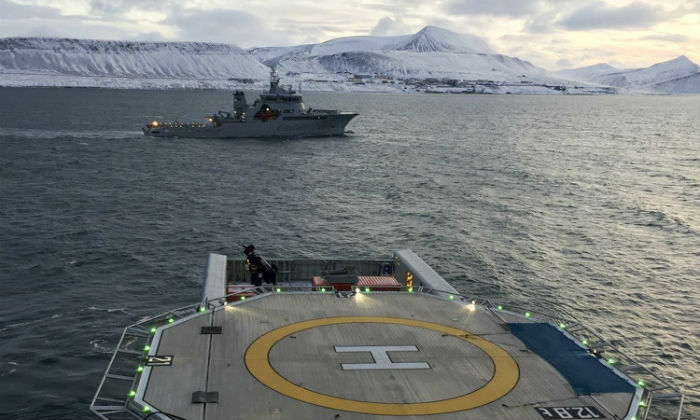 The crew aboard the doomed helicopter had no reason to attempt that trip to the long-abandoned mining village of Piramida in poor weather, but Moscow insists on maintaining an active presence on the Norwegian archipelago. 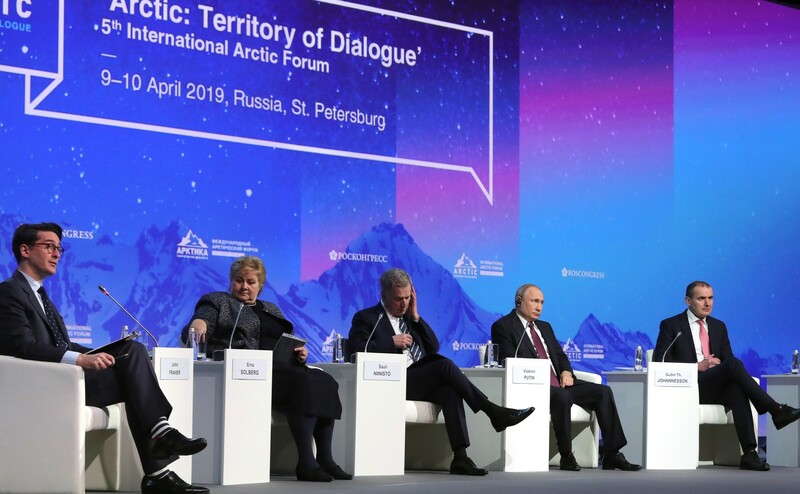 Foreign Minister Sergei Lavrov, speaking at a recent meeting of the Barents Council, departed from the usual cooperative discourse and accused Norway of enforcing restrictions on Russian activities in Spitsbergen, including helicopter flights. 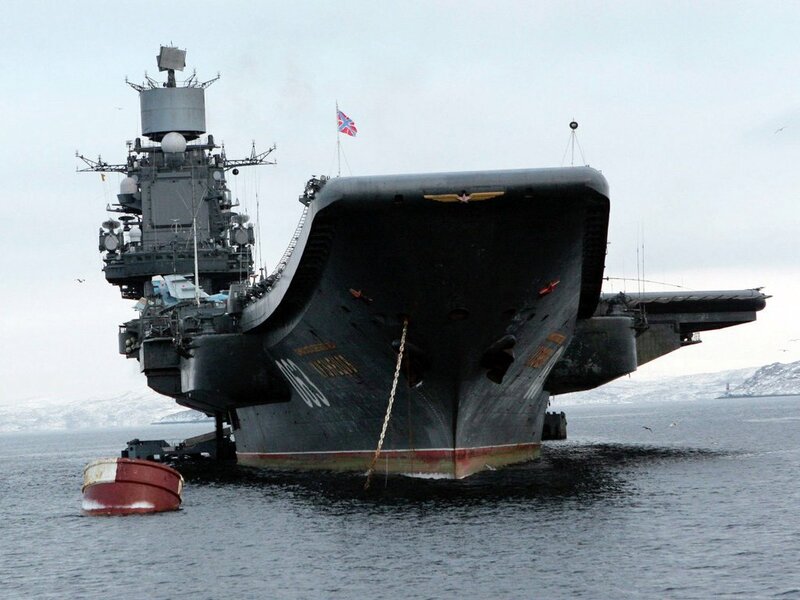 The Russian Ministry of Defense, meanwhile, has accused Norway of threatening Russia’s interests in the Arctic, and specifically on Spitsbergen. This persistent exaggeration of external threats is supposed to justify Russia’s own build-up of military capabilities and infrastructure in the High North. The Northern Fleet demonstrated its firepower during the Zapad 2017 series of exercises, which are still being evaluated at the North Atlantic Treaty Organization’s (NATO) headquarters. 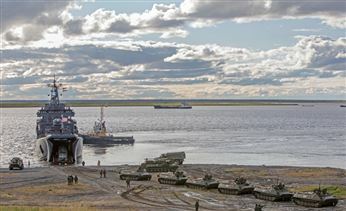 Amphibious operations supported by missile strikes were the main feature of this year’s Zapad war games, which extended from the new base on Kotelny Island, in the East Siberian Sea, to Novaya Zemlya and Franz-Josef Land, in the Barents Sea. The Russian Arctic Command, established in December 2014, seeks to show readiness to defend navigation along the Northern Sea Route (NSR); but the main problem there is the rotten infrastructure, not piracy. Rosatom, which owns the fleet of Russian nuclear icebreakers, has been trying to gain administrative control over the NSR, but the Ministry of Transport defends its turf, arguing that new funding should go to projects that have no nuclear content. For Moscow, the strategic importance of the Arctic theater came into sharp focus last week, during night-long exercises of Russian strategic forces involving the whole triad of long-range aviation, intercontinental ballistic missiles (ICBM), and strategic nuclear submarines. The bombers did not venture far, but aimed their missiles at targets in the northern Pemboi test-site; the only ICBM tested was an old Topol, launched from the Plesetsk cosmodrome, in the Arkhangelsk region; one submarine fired a missile from the Barents Sea toward Kamchatka, and another fired two missiles from the Sea of Okhotsk toward the White Sea. The submarines involved were not named, so it is unclear whether at least one advanced Bulava missiles was tested—indeed, the track record of its tests is abridged and checkered. The Kremlin announced that President Vladimir Putin personally launched four ballistic missiles. The credibility of this statement appears dubious because a submerged submarine can launch its missiles only by an order of its commander. Kuznetsov before departing to the Mediterranean. Russia has found itself in a very different international situation than that envisaged by its basic documents in 2013, so there was clearly a need in revising its Foreign Policy Concept – and President Vladimir Putin duly approved a new one on 30 November 2016. The Concept is more assertive and harshly worded than the previous one, and in the opinion of Andrei Kortunov, one of the voices of reason among the mainstream experts in Moscow, doesn’t reflect the most recent changes in the Russian course, so it appears like “the light of a distant star, which reaches us on a delay”. The Concept comes to the Arctic matters only in Article 76, so it is definitely not a set of issues of high priority, which doesn’t preclude Russian commentators to claim that the “course is set toward the Arctic“. Nothing is said about Russia’s claim for expanding its continental shelf, which is presently under consideration in the UN Commission on the Limits of the Continental Shelf (UN CLCS), but the point is made that the international law provides a “sufficient base” for resolving all disputes. The Concept acknowledges the particular role of the Arctic Council, and also mentions particular responsibilities of the five littoral states. The main emphasis is placed on preserving “peace, stability and constructive international cooperation in the Arctic”, and it is further reinforced by the pledge to counter any efforts aimed at bringing to the Arctic “elements of policy of confrontation and military counter-balancing”. Rather more difficult to understand is the follow-up to this pledge rejecting “politicization of international interaction in the region.” Politicization is far preferable to militarization, and Russia is firm set on this latter track. For that matter, the Norther Fleet has proudly reported a 60% increase in missile launches in 2016 comparing with 2015, which is difficult to check, but quite certainly the test launch of the anti-ship Granit missile on a target on-shore was a first. The Northern Fleet is going to get back a major surface combatant, as the modernization of Marshal Ustinov missile cruiser is finally coming to completion. The flagship of the Northern Fleet, Russia’s only aircraft carrier Admiral Kuznetsov, hasn’t exactly covered itself with glory in the first combat deployment to Eastern Mediterranean, as two fighters were lost due to technical failures. The Concept also has a few things to say about the Northern Europe (nothing about Southern Europe, or Eastern Europe, or the Balkans, for that matter), where a “zone of peace and stability based on the principle of equal and indivisible security” is to be preserved (Article 71). Sounds very nice, but makes a poor fit to the prevalent discourse on “Anglo-Saxon strategy of hybrid threats”, as exemplified by this recent lengthy article in Nezavisimaya gazeta. Dmitry Peskov, the press secretary to President Vladimir Putin, is generally not known for eloquence. But his comment last week (June 7) about the North Atlantic Treaty Organization’s exercises in the Baltic region stands out both for its convolutedness and uncharacteristic meekness. 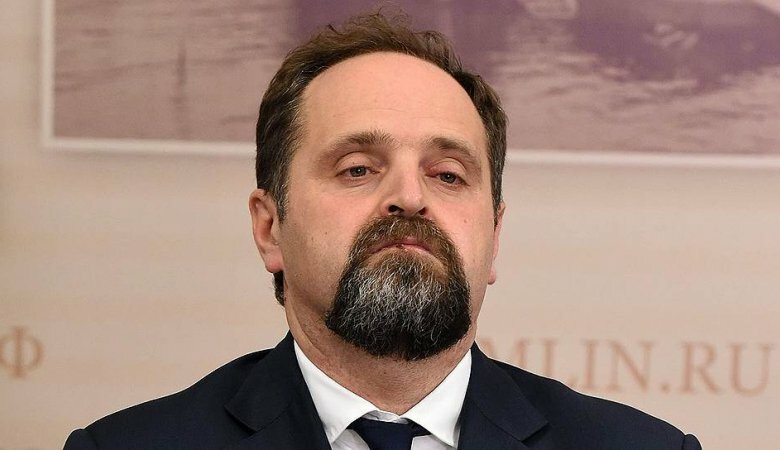 His point, reproduced by all Russian mainstream media, can be approximately translated as: “In any case, such exercises, which have a legend based on rather straightforward identification in the quite clear direction, they do not contribute to the atmosphere of trust and security” (RIA Novosti, June 7). Peskov’s elliptic reference to the lack of trust between Moscow and the West in fact highlights the unusual self-restraint present in Russia’s military behavior over the past couple of months. This moderation—while sometimes camouflaged by harsh rhetoric—remains largely unexplained. NATO’s Anakonda 2016 exercises in Poland as well as the Baltops 2016 naval exercises in the Baltic Sea are being thoroughly covered by the Russian media, and there is no shortage of hysterical commentary (Rossiiskaya Gazeta, June 8; Nezavisimaya Gazeta, June 6). Meanwhile, Russia’s Ministry of Foreign Affairs issued several vague promises to respond to these exercises, including in the case of the USS Porter, which recently paid a planned visit to the Black Sea (Lenta.ru, June 10). Nevertheless, no aggressive Russian intercepts or mock attacks have been registered so far, and the official news agencies are even airing Western military opinions on professional and problem-free encounters with the Russians (RIA Novosti, June 11). In 2015, Russia conspicuously responded to any scheduled NATO exercises with its own snap drills that tended to be at least twice as large; presently, the picture is strikingly different. It is certainly not the case that Russia is doing nothing. Two army brigades are being redeployed from the Volga-Urals region closer to the borders with Ukraine without any public fanfare (RBC, June 11). This most probably fits into the plans for building three new divisions in the Western direction, announced by Defense Minister Sergei Shoigu at the start of the year (Gazeta.ru, June 1; see EDM, January 19, April 5). It is possible that the plan for deploying batteries of Iskander-M tactical missiles to the Kaliningrad region and to Crimea is also being implemented in a clandestine manner (Nezavisimoe Voennoe Obozrenie, June 3). Allegedly, these secret missile redeployments, if true, are being made in response to the opening of the United States’ missile defense base in Romania, which Putin pointedly condemned as a “direct threat” to Russia’s security (Ezhednevny Zhurnal, May 30). This US missile defense facility is incapable of threatening Russia’s overwhelming strategic nuclear forces. And neither could the SM-3 missile interceptors be converted into strike weapons by a mere “change of software” (as Putin claims). Nonetheless, Moscow’s desire to counter the long-prepared US “aggressive” step was unmistakable—although any overt tangible response has apparently been postponed (New Times, June 10). Signs of the same cautiousness can also be seen in the conduct of Russia’s military intervention in Syria. On June 10, in Tehran, Shoigu discussed with his Iranian and Syrian counterparts the course of the offensive operation against Raqqa, the stronghold of the Islamic State. However, he did not commit to any increase in the intensity of airstrikes (Kommersant, June 10). The arrival of the US aircraft carrier Harry S. Truman to the Eastern Mediterranean was duly noted in Moscow, but the combat order of the Russian naval squadron in the Syrian waters was left unchanged (Gazeta.ru, June 6). Apparently, the Russian top brass are more worried about the risks to Russia’s own forces than about the lack of success in suppressing Syrian rebels of various persuasions, particularly as yet another fighter jet crashed, outside Moscow, in recent days (RBC, June 9). Russian ambiguity and slowness in delivering on the promised responses to all sorts of challenges may be aimed at exploiting divisions in the Western camp. Indeed, it makes perfect sense to postpone the probing of NATO vulnerabilities in the Baltic theater until after the Warsaw summit (Slon.ru, June 10). The Kremlin is upset with the firm position taken by Germany on the need to contain the Russian challenge, but holds out hope for a heavy blow to Europe’s unity should the United Kingdom vote to leave the European Union in the upcoming referendum (Novaya Gazeta, June 6). The key matter here is certainly the relaxation of the sanctions regime, even if 71 percent of Russians now expect that sanctions will be prolonged for another year (Levada.ru, June 8). Such expectations reflect the growing public pessimism about Russia’s economic prospects, and no amount of upbeat propaganda can counter the impact of steadily falling incomes. Putin is trying to put a positive spin on the carefully doctored macro-economic statistics, but the contraction of domestic consumption is set to deepen (RBC, June 8). Meanwhile, enthusiasm about effective power projection in Syria has dissipated, and Russians now express the opinion that it is economic prosperity and not military power that constitutes the key characteristic of a “great power” (Kommersant, June 10). This shift in public mood plays into the hands of economic pragmatists, such as Alexei Kudrin, who try to convince Putin that a return to growth and prosperity is possible only with a reduction in geopolitical tensions (Politcom.ru, June 6). Russia’s ambivalent self-restraint in the last couple of months is probably an attempt at such de-escalation, but there are few reasons to believe that it will pay any dividends. The resonance in the West of Russia’s gross violations of the norms of international behavior far outweighs any impression made by a pause in Russian military exercises—particularly since the hostility of Moscow’s anti-Western rhetoric has remained severe. Putin may wish to increase his space for maneuver, but the Kremlin’s promises to forcefully respond to NATO’s strengthening containment capabilities and to the imaginary encroachments on Russia’s security frontiers keep multiplying. Although nobody is going to hold Putin to these promises, he knows that he can demand loyalty from the disgruntled and squabbling siloviki (security services personnel) only as long as he keeps proving the firmness of his ruling hand. As long as the demonstrated prudence serves the purpose of deception and maskirovka (Russian military deception), it is perfectly fine, but going for real compromises risks showing weakness. Attempting another proactive move might be a safer option, but Putin needs to score on the cheap—and the bills for the earlier “victories” keep piling up. The presentation of the Russian claim on expanding its continental shelf in the Arctic was a low-key affair at the UN. Can the United States and Russia actually cooperate in the Arctic? It might seem like wishful thinking, given that Russian Prime Minister Dmitry Medvedev asserted that there is in fact a “New Cold War” between the two countries in a speech at the Munich Security Conference. Many people—at that conference and elsewhere—see the idea as far-fetched. Sure, Russia is launching air strikes in what has become an all-out proxy war in Syria, continues to be aggressive against Ukraine, and has increased its military build-up in the High North. To many observers, the notion of cooperating with Russia in the Arctic was a non-starter as recently as the mid-2015. There have been, however, significant changes in Russia’s behavior in the last several months—so, maybe it is possible to bracket the Arctic out of the evolving confrontation. These and other matters were the subject of discussion at a recent conference at the Harriman Institute of Columbia University in New York, in which we had the pleasure to partake last week. More reflections from Pavel Baev and Tim Boersma are at the Order from Chaos, 18 February 2016. Russia appears firmly set on its course of militarization of the Arctic. In a region where economic activities are mostly declining and where environmental challenges are on the rise, Russia appears to be engaged in a one-sided arms race. It is glaringly obvious to observers outside the Kremlin that Russia’s severe economic recession makes this course unsustainable. 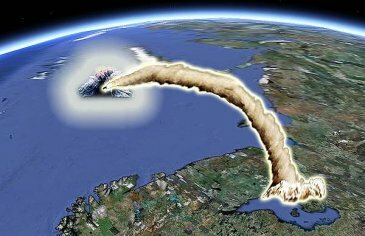 Russia may aspire to Arctic greatness, but there is little there to achieve and Russia is unlikely to be able to achieve it. This is the bottom line from my post at the Brookings blog Order from Chaos, August 27. Putin addresses the naval parade in Baltiisk. Many Arctic watchers were glad to hear about the agreement on prohibiting fishing in the newly-opening waters around the North Pole, signed a couple of weeks ago in Oslo by Canada, Denmark, Norway, Russia and the USA. Indeed, it was a significant step in protecting migrating fish stocks – but Iceland declared strong reservations. It often resents activities in the Arctic-five format because it is not included on formal grounds, while to all intents and purposes, it is certainly a maritime Arctic state. For Russia, the agreement constituted an important proof of its commitment to Arctic cooperation and readiness to address particular issues, despite the evolving confrontation shaped by the Ukraine crisis. This commitment stands in huge contrast with Russia’s expanding military activities in the High North, which the Arctic Council cannot address in any meaningful way due to the limits of its mandate – but neither can it ignore this militarization. It was very strongly pronounced in the new version of Russian Maritime Doctrine, approved by President Putin last Sunday. It was Deputy Prime Minister Dmitry Rogozin who presented this document and he placed a particular emphasis on the Arctic strategic direction, giving the Sevmorput as the main reason, then pointing to the free access to the Atlantic and (rather anti-geographically) to the Pacific, and then mentioning the natural resources. It is interesting that oil-and-gas matters, which used to be the highest priority in Russian perceptions of Arctic politics, are de-prioritized, but such mundane matters as fisheries are hardly registering at all in the big geopolitical picture. Putin used the occasion of the Navy day to announce the revisions in the Maritime Doctrine and the expansion of naval activities in the Arctic is indeed very visible. A couple of days prior to this announcement, Admiral Vladimir Korolev,the Commander of the Navy, had informed that the tree Borei-class submarines (Yuri Dolgoruky, Aleksandr Nevsky, and Vladimir Monomakh) would go this year into the Arctic for combat training. 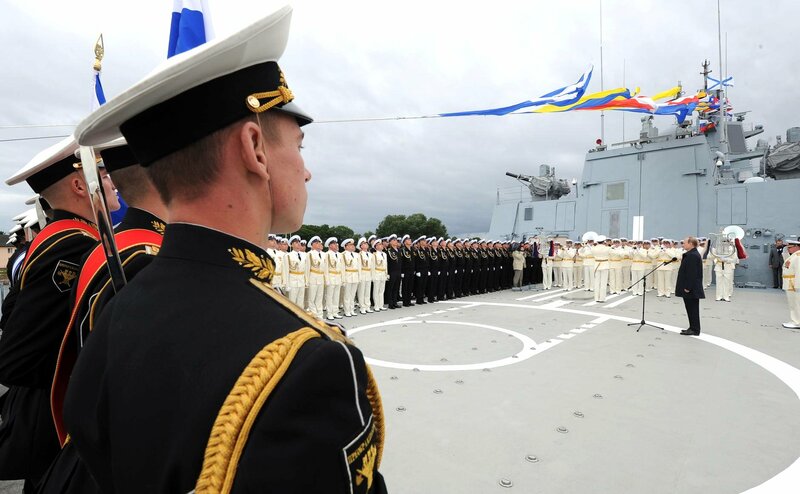 It is unclear, whether this means that the plan for transfer of Aleksandr Nevsky to the Pacific Fleet in September this year is cancelled. Setting new ambitious maritime goals may sound very grand and make international headlines, but in fact, the Russian Navy is not in a very good shape – and is set to be a big loser in the unavoidable deep cuts in the 2020 Armament program. Rogozin was forced to admit earlier this month that shipbuilding was severely affected by the interruption of cooperative ties and had failed to proceed with import substitution. 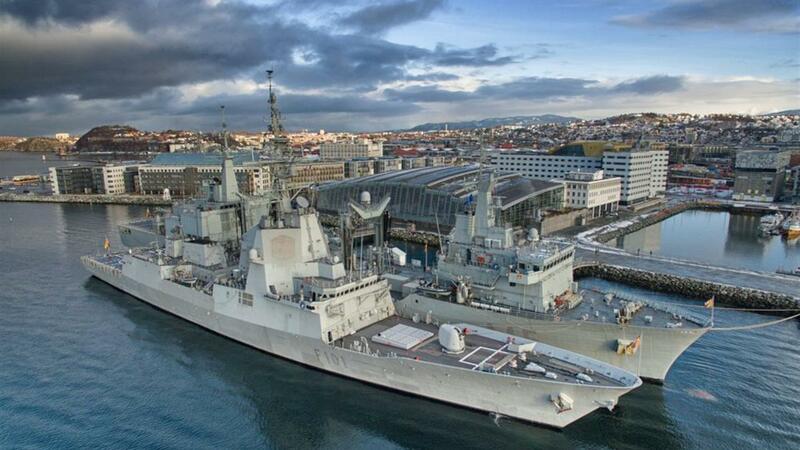 The cancellation of the major deal with France on the delivery of two Mistral-class amphibious assault ships for the Russian navy was a big blow to the plans for expanding naval power projection capabilities. Symbolically, at the naval parade in Baltiisk which Putin attended, a missile failed to launch from a ship, and at the Black Sea Fleet parade in Sevastopol, a missile broke down immediately after launch. These embarrassing technical failures remind that the Bulava missile for the Borei-class submarines is now mass-produced without completing the whole program of tests, and the track record of these tests is far from stellar. The risks involved in demonstrating Russia’s naval might may be acceptable by Russian standards – but they are seriously worrisome for the European states who happen to be its neighbors. It was a peaceful place once upon a times. These ageing workhorses hardly make a convincing demonstration of Russia’s air might. What is less obvious for many Russia-watchers is that the military strength demonstrated so pompously on the Red Square during the May 9 Victory Day parade is also in decline. In Ukraine, the lack of any meaningful political or strategic Russian goals erodes the morale of the troops who are clandestinely deployed there. Nervous about the domestic political consequences of growing casualties, Putin has classified information about warzone deaths as a state secret. The costs of the war are mounting, and over-spending in the Armaments 2020 priority procurement program is yet another item in the list of embarrassing fiscal setbacks. It is clear to serious Russian economists that military expenditures have been out of control for the last four quarters at least. Such spending cannot be sustained indefinitely, and deep cuts in the defense budget are certain this year. I didn’t expect this point to find corroborating evidence in the accident with a Tu-95MS strategic bomber that caught fire on the runway of the Ukrainka airbase in the Far East with the loss of life of one pilot. It is a striking coincidence that earlier this week two other accidents happened in the Russian Air Force: a MiG-29 fighter crushed during a training flight in Astrakhan oblast (both pilots safely landed on parachutes) and a Su-34 fighter-bomber had a hard landing in Voronezh oblast (the pilot was rescued). 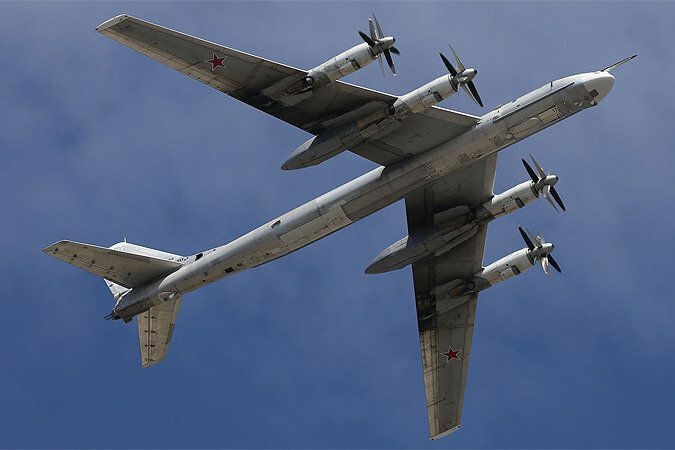 Norwegian and other NATO pilots have become quite familiar with ageing Tu-95s, and it is very fortunate indeed that the accident happened on the ground – and not during a strategic patrol over the Arctic ice, where suspicions about foul play would have inevitably exploded in Moscow leading to a further escalation of tensions.